With the last of the preps running over the weekend for the 2018 Kentucky Oaks, an idea of which 14 fillies get in the starting gate May 4 is starting to finalize. The top two point earners are the likely favorites, with Midnight Bisou and Monomoy Girl both entering the Oaks off Grade 1 wins. Here’s a look at the first 14 and those on the bubble potentially set to run May 4 at Churchill Downs. 1.) Midnight Bisou (Midnight Lute – Bill Spawr – Allen Racing LLC and Bloom Racing Stable LLC – 160): Midnight Bisou may be the only filly representing the West Coast this year, with previous contenders coming off the Oaks trail. She’s on a three-race win streak with wins in the Santa Anita Park's Santa Ynez Stakes (G2), Santa Ysabel Stakes (G3) and the Santa Anita Oaks (G1). 2.) Monomoy Girl (Tapizar – Brad Cox – Michael Dubb, Monomoy Stables LLC, The Elkstone Group LLC and Bethlehem Stables LLC – 154): The biggest competition for Midnight Bisou appears to be Monomoy Girl. She broke last in the Rachel Alexandra Stakes (G2) and rallied to win before running away with Keeneland's Ashland Stakes (G1) on the lead. 3.) 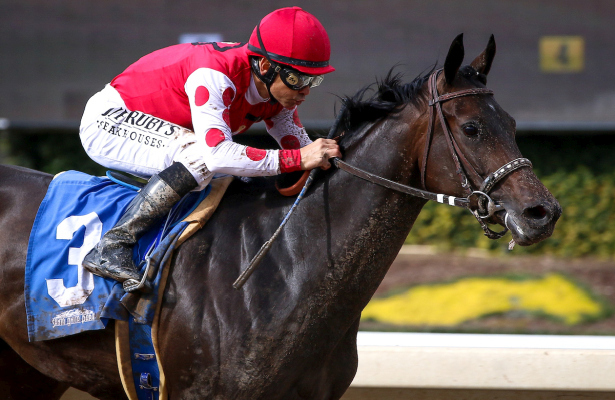 Sassy Sienna (Midshipman – Brad Cox – Medallion Racing and Jerry McClanahan – 115): She nabbed her first stakes win at the perfect time, winning Oaklawn Park's Fantasy (G3) by a nose Friday to secure her spot in the Kentucky Oaks. She started the year with an allowance win and followed that effort with two on the board finishes in the Martha Washington and Honeybee (G3) stakes. 4.) My Miss Lilly (Tapit – Mark Hennig – Courtland Farms – 112): Purchased for a lofty $670,000 as a yearling, My Miss Lilly earned her first stakes win in her fourth start. Aqueduct's Gazelle (G2) came down to a three-horse finish and My Miss Lilly got up to win by half a length. 5.) Chocolate Martini (Broken Vow – Tom Amoss – Double Doors Racing LLC – 100): Chocolate Martini won her first race in maiden claiming company, was purchased in her next race, then won an allowance and the Fair Grounds Oaks (G2) for her new connections. 6.) Coach Rocks (Oxbow – Dale Romans – Roddy Valente, RAP Racing and West Point Thoroughbreds – 100): It took Coach Rocks seven tries to break her maiden, but she scored big next out in the Gulfstream Park Oaks (G2). Part of her ownership group? Former University of Louisville coach Rick Pitino, a Hall of Famer. 7.) Rayya (Tiz Wonderful – Bob Baffert – Sheikh Rashid bin Humaid Al Nuaimi – 90): The UAE Oaks (G3) winner faced the boys in Meydan's UAE Derby (G2), finishing second by 18 ½ lengths to Kentucky Derby contender Mendelssohn. Rayya has since been transferred to trainer Bob Baffert and is training in California. 8.) Wonder Gadot (Medaglia d’Oro – Mark Casse – Gary Barber – 84): Thought to be a big Oaks contender at the beginning of the year, Wonder Gadot has hit the board in four preps this year. Her last win was in the Demoiselle (G2) in December, though she came close to topping Sassy Sienna in the Fantasy. 9.) Eskimo Kisses (To Honor and Serve – Kenny McPeek – Magdalena Racing, Gainesway Stable and Harold Lerner – 80): Eskimo Kisses made big runs from last in the Fair Grounds Oaks and the Ashland and came in second both times. She lost by only a head to Chocolate Martini, but finished 5 ½ lengths behind Monomoy Girl. 10.) Take Charge Paula (Take Charge Indy – Kiaran McLaughlin – Peter Deutsch – 70): The big challenge for Take Charge Paula will be the 1 1/8-mile Oaks distance. Although a four-time stakes winner, she has yet to win past seven furlongs. She's the first filly on this list that doesn't seem certain to run at Churchill Downs. 11.) Cosmic Burst (Violence – Donnie Von Hemel – Norma Lee Stockseth and Todd Dunn – 62): Cosmic Burst ran down a previously undefeated Amy’s Challenge to win Oaklawn's Honeybee. She only managed fourth next out though in the Fantasy. 12.) Blamed (Blame – Joel Marr – Cleber Massey – 50): Blamed extended a five-race win streak in the Sunland Park Oaks but will be facing much tougher competition at Churchill Downs. The Kentucky Oaks will be her first start outside of New Mexico if she runs. 13.) Amy’s Challenge (Artie Schiller – McClean Robertson – Novogratz Racing Stables Inc. – 40): Amy’s Challenge is another filly who hasn’t won beyond sprinting distances. She took her first three starts, including two stakes, before running second and third respectively in the Honeybee and Fantasy. 14.) Patrona Margarita (Special Rate – Bret Calhoun – Craig Upham – 35): The Texas-bred filly was a surprise winner of the Pocahontas Stakes (G2) last fall at Churchill. Five months later she returned in Fair Grounds' Rachel Alexandra and finished fourth behind Monomoy Girl, then a distant third behind her in the Ashland. Should any of the Top 14 choose not to run in the Kentucky Oaks, Classy Act would get first preference. The Bret Calhoun trainee was runner-up in the Rachel Alexandra and ran fourth in the Fair Grounds Oaks. Princess Warrior is still looking for her second career win. She picked up Oaks points in the Alcibiades (G1) last year and in the Gulfstream Park Oaks but was most recently eighth in the Fantasy. Rounding out the Top 20 is Virginia Key, third in the Gazelle; Red Ruby, who won the Martha Washington and ran fourth in the Honeybee; Heavenhasmynikki, third in the Davona Dale; and Stronger Than Ever, the Silverbulletday winner who returned to run sixth in the Honeybee.